This article will appear in The NYTimes on Sunday, in the Arts & Leisure section. North Adams, Mass. — The word that Joseph C. Thompson had been waiting for finally arrived on Aug. 8: Gov. Deval Patrick of Massachusetts had signed a $1.4 billion capital facilities bond bill. Inside was a $25.4 million earmark for the Massachusetts Museum of Contemporary Art, which gave Mr. Thompson, the museum's director, funds to start the last phase of an effort he helped hatch nearly three decades ago: transforming an abandoned 19th-century factory complex into a destination arts center that could help revive the struggling economy of North Adams. Despite setbacks that threatened its existence, part of his dream has now been realized. Last year, Mass MoCA attracted a record 162,000 visitors. It adds more than $20 million a year to the regional economy, including the businesses that rent its surplus space, according to the Center for Creative Community Development at Williams College. And it has become a model for hundreds of other localities hoping to use culture as an economic driver. "Mass MoCA has become a really important asset in North Adams," said Jamie Bennett, executive director of ArtPlace America, which awards grants to encourage such "creative placemaking" pursuits around the country. Ripe for growth, Mass MoCA will now spread into nearly all corners of its 26-building campus. It will double its exhibition space to 260,000 square feet — more than DIA:Beacon's 240,000 square feet in Beacon, N.Y., and just shy of the total gallery space at the sprawling Los Angeles County Museum of Art. But the expansion will again test Mass MoCA, which has teetered several times before and since its opening in 1999. Most notably, the museum brushed with financial disaster in 2006, thanks to the exploding costs of a vast, unfinished installation by the Swiss artist Christoph Büchel. It blew past its $165,000 limit to about $385,000, driving the budget "to the brink," Mr. Thompson said, at a time when Mass MoCA had no endowment and no cash reserve. An ensuing dispute — Mr. Büchel charged that Mass MoCA had mismanaged the project and had allowed some people to see the work before completion, while the museum called his demands unreasonable and said he had abandoned the project — landed in court, and though the parties eventually settled, both sullied their reputations in the process. Since then, in some eyes, Mass MoCA has lost some of its appetite for risk. The expansion conceived by Mr. Thompson, aside from putting new pressure on the museum's small staff, $7 million annual budget and minuscule $3 million endowment (plus $12 million in reserves), may further challenge the museum's stated identity as "an experimental platform for art making." His plans call for Mass MoCA to devote half its exhibition space to art that already exists. By the time it opened, Mass MoCA had already evolved from its initial conception as a visual arts museum. After listening to donors and neighboring institutions like the Jacob's Pillow dance center, Mr. Thompson added performing arts to the mix. The museum devotes "a full 50 percent of our curatorial and financial and emotional bandwidth to the performing arts," he said, from the Bang on a Can contemporary music festival to performances by Don Edwards, the cowboy poet. They appeal, in particular, to local audiences. More recently, alongside new works by artists like Teresita Fernández and Darren Waterston, both now on view, Mr. Thompson has added galleries for works by contemporary masters. It started with a 25-year renewable venture with the Yale University Art Gallery that brought 105 of Sol LeWitt's large-scale wall drawings to Mass MoCA, uniting them in one spot for the first time on nearly an acre of wall space. When the installation opened in 2008, Holland Cotter of The New York Times called the setting "close to perfect." For Mass MoCA, it was also close to a permanent collection, which it lacks. "Before that, everything we did changed every year, and when you change shows, the cupboard may be bare," Mr. Thompson said. One day last month, he showed off a second semi-permanent installation, which opened last September: three massive works by Anselm Kiefer borrowed from the Hall Art Foundation and installed in a renovated water tank building. The foundation paid for the revamping of the building, landscaping and most of the increased operating costs. "We would never have done it ourselves," Mr. Thompson said. "We focus on emerging and midcareer artists who want to make something large, and we like to fabricate the art with them. Kiefer has his own studio and doesn't need our help. But he found the spaces here to be very compelling." Together, the LeWitt and Kiefer exhibitions have muddied Mass MoCA's profile as a presenter of experimental art. Much of the public comes to see them. It was the Kiefer opening and the display of Xu Bing's "Phoenix," two gigantic birds made of detritus, that pushed 2013's attendance far above the more typical 120,000 visitors. Critical reaction has been split. 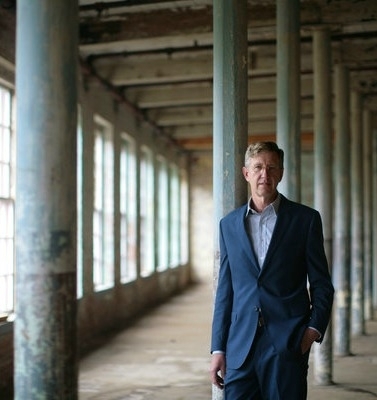 "Christoph Büchel dragged Mass MoCA's name through the mud, but it still has a significant reputation," said Dean Sobel, director of the Clyfford Still Museum in Denver. "They are as interested in exploring the fringe and what's new as most significant contemporary art museums are in this country." But some curators at those museums, while declining to speak on the record for collegial reasons, disagree. Among the words they used to describe Mass MoCA's curatorial program are "less ambitious than it once was," "more middlebrow" and "gun shy." Michael Darling, chief curator at the Museum of Contemporary Art in Chicago, noted, though, that since the recession, many museums have focused more on artists with name recognition. "There's more wariness about taking on something too new or too experimental among us, including Mass MoCA," he said. Still, the artists Mass MoCA have selected credit it for allowing experimentation. Mr. Waterston, a painter, was invited to use a large wall as his canvas. Instead, he proposed "a much more ambitious project, on a very different scale, requiring more resources and more space," he said. "I was responding to the nature of Mass MoCA," he added, "and the kind of projects it is known for, projects that otherwise would never be realized." 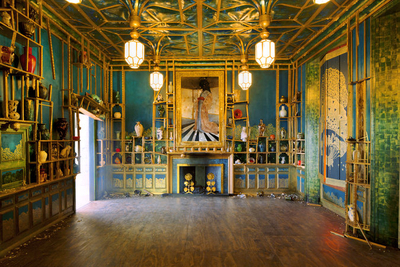 The work he created, "Filthy Lucre," is a reimagining of James McNeill Whistler's masterpiece of lavish decoration, "Harmony in Blue and Gold: The Peacock Room," which was the subject of a major row in 1876 between Whistler and a Liverpool patron over style, content and money. Mr. Waterston concocted it as a dramatic ruin: warped bookcases, overturned ceramics, a melting mural. The favorable review in The Boston Globe said that the work "ghoulishly satirizes the extreme wealth exemplified by Gilded Age industrialists, and draws a clear line to today's 1 percent, buyers who snap up wildly expensive art on a whim and drive an overheated market." "Filthy Lucre" will travel next year to the Freer and Sackler Galleries of the Smithsonian Institution, which owns Whistler's "Peacock Room." Mr. Waterston praised the "incredible range of skills" of the artisans that Mass MoCA employs, who were key in its fabrication. "Even a huge institution like the Smithsonian could never have done it," he said. "And it completely set me on a whole other trajectory. I'm not just a painter anymore." Performers like David Byrne have also used Mass MoCA as a petri dish. Citing Mr. Byrne's "Here Lies Love," his musical about Imelda Marcos, as an example, Mr. Thompson said, "David called and asked to work out aspects of it here," which led to a five-night run there in June 2012. Will the expansion swamp that identity? It calls for little change in space and budget for performing and homegrown visual arts programs (music, dance and theater festivals, as well as six or seven special exhibitions a year). Instead, the 120,000 square feet of new gallery space will be filled with installations like Mr. Kiefer's. Mr. Thompson is talking with four potential partners — artists, foundations and collectors — and he insists that these deals, with most expenses paid by the partner, are a strength, not a weakness. "There are enough institutions that program their own voice," he said. "Multiple voices, sometimes contrary voices, strike me as more interesting." Undoubtedly, state officials were encouraged to ante up for the expansion by this low-risk formula, along with North Adams's striking unemployment rate. Before Mass MoCA opened, it was seven times the state average, and at 8.1. percent this June, it was still higher than the 5.5 percent state rate. A bigger Mass MoCA, according to its own projections, is likely to draw 185,000 visitors a year, with many expected to linger in the area, spending money in hotels, restaurants and stores. Imitators might find that Mass MoCA's experience is not easily replicated, however. It started out with two undeniable assets: excess space, about 90 percent of which is now leased, and its location in the Berkshires, a summer tourist destination full of cultural assets, like the Sterling and Francine Clark Art Institute and the Williams College Museum of Art, both nearby in Williamstown. The three museums have benefited from "extraordinary synergy," says Michael Conforti, director of the Clark, enhanced at times by joint ticketing. On July 4, the Clark opened expanded galleries, and once Mass MoCA grows, officials hope that day-trippers will become overnighters. To complete Mr. Thompson's plan, Mass MoCA must raise $30 million from private donors, about half for the museum's endowment. "The expansion is unquestionably good for the region and the community; the challenge is to pull it off," said Stephen C. Sheppard, director of Williams's Center for Creative Community Development. "They will need to connect with people who share their vision and who'll support it." State money will allow the expansion to begin, though, with the opening of new spaces, if all goes quickly, in 2016 — 30 years after Mass MoCA was proposed.